Reliance Jio has now partnered with Flipkart-owned payments service PhonePe to provide users with cashback on purchasing the Rs. 399 recharge. as ‘Holiday Hungama’, on Rs. 399 Jio recharge will be provided only between June 1 and June 15, and will be applicable only on purchases made using the MyJio app. Holiday Hungama will give to its users a Rs. 50 cashback to customers on buying the Rs. 399 prepaid pack. Users will have to select PhonePe as the payment option while making the transaction in order to receive the cashback. This cashback can be clubbed with the Rs. 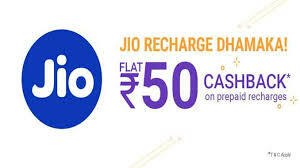 50 discount vouchers Jio has provided to customers in the past, so a user will be able to get the Rs. 399 Jio recharge at an effective price of Rs. 299.